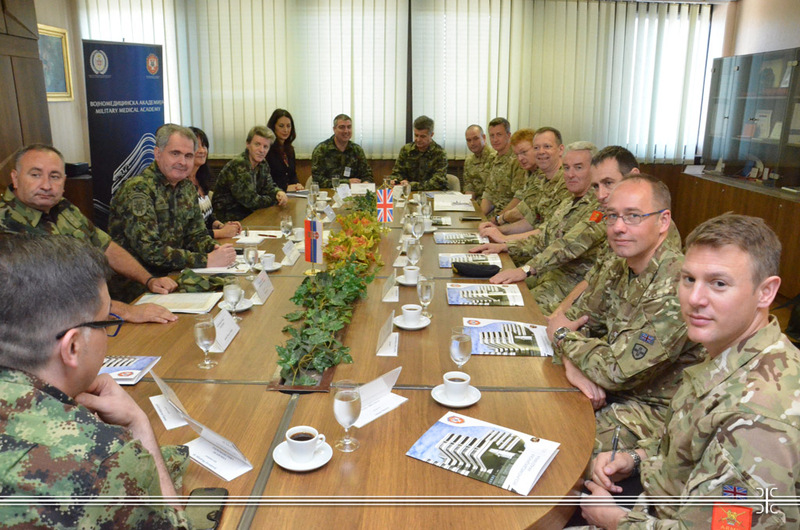 During the course "The effects of highly toxic chemicals, preventive measures and treatment," which was organized from 12 to 14 May 2015, at the Military Medical Academy for four members of the Armed Forces of the United Kingdom, the General Director of the Army Medical Services of the United Kingdom, Major General Jeremy Rowan visited the Military Medical Academy. The Acting Head of the MMA Col. Prof. Zoran Segrt expressed his satisfaction with the intensified bilateral military medical cooperation, which started with the visit of General Rowan in 2012. He presented all aspects of the Military Medical Academy work, in particular the treatment and education. He said that the experience acquired through international cooperation such as this with the UK and the participation in peacekeeping missions have a positive impact on all aspects of MMA’s activities. As a positive example of bilateral cooperation he mentioned the first joint training and practicing during the exercise AUTUMN 2014 and seminar on war surgery and toxicology that was realized in November 2014 at the MMA. General Rowan shared his positive impressions about the visit while he had the opportunity to see the capacity of the Regional NBCR Centre in Krusevac because the British side is very interested in training in the field of CBRN protection and care. At the end of the course the Head of the National Poison Control Center Prof. Dr. Slavica Vucinic presented the certificates to the UK participants of the course.